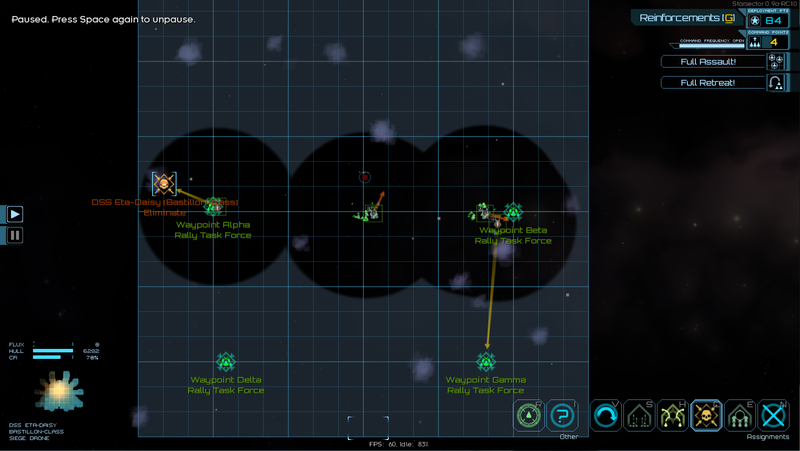 I've come across a recurrent issue with fighting domain probes (In particular) where if I send in a single ship to fight them I tend to have a problem where 1-2 enemies will consistently wander off. Generally they'll go off to the left or right but I've seen them go all over, the end result being that I'll need to bring in extra ships to manually scour the field to find them. It occurs at a near 100% rate if I send in a single ship to clear out a probe, 2 or more generally means that enough of the field is covered that none can sneak away. It's not so much the supply cost that's the problem here it's more that it extends the battle to an annoying degree. Exactly happens for me, like 90% of battle against them, if you send just one ship against them, you will always have one domain drone who will hide for ten minutes and where you need to send many others ships for scout. In fact, here's a screenshot of a battle currently in progress, this drone has gone all the way to the map border, and all four ships currently present were deployed at the start of the battle as well . It's also the second drone that I had to hunt down in this battle. He didn't try to re-engage when found either he just kinda, went around in circles. And he was predamaged so he'd been in the main fight at some point and then wandered off. Also yes this is a modded game but it occurs in exactly the same way and equally as frequently in my vanilla file. Thank you - this is on my list for the .1 release.